New Approaches to Elementary Classroom Music was written by Rebecca Herrold. New Approaches to Elementary Classroom Music was published by Prentice Hall. About Rebecca Herrold (Author) : Rebecca Herrold is a published author. 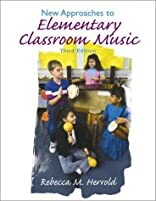 Published credits of Rebecca Herrold include New Approaches to Elementary Classroom Music (3rd Edition).